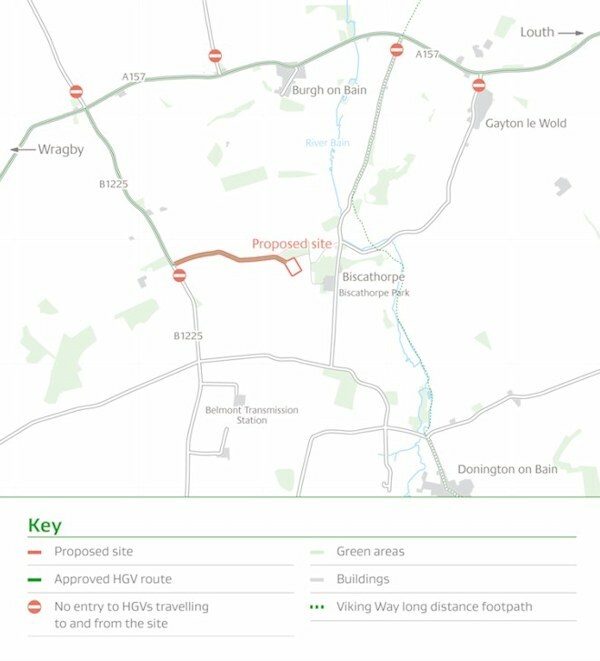 On Wednesday 21st May Egdon Resources held a public exhibition of their plans for a conventional oil well near Biscathorpe. These plans are for a different site than their previous application, which was made in September 2013 and later withdrawn. I spoke to Mark Abbott, managing director of Egdon Resources. He told me that the earlier application was withdrawn because of issues with the traffic route, which would have taken HGV vehicles over the river Bain. "Crossing the Bain was the main concern," he said. The new route is illustrated in the graphic below. Mr Abbott estimated that there would be a 3% increased traffic load as a result of this development. "This doesn't impact on any villages," he said. "It's a far more robust site." Egdon's initial plans are for a temporary test well. This will drill to a depth of between 1900 and 1950 metres. But there's uncertainty about exactly what is down at that level. Mr Abbott told me that they hope to find 10 million barrels of oil, which would make Biscathorpe the third or fourth largest well in the Lincolnshire and Nottinghamshire area. However, this is an estimate. "We're not certain of the thickness of the sand layer," Mr Abbott said. That means there might be anything from less than a million barrels to slightly more than 10 million. What's more, Mr Abbott said there was only "a 25 to 30% chance of finding commercial hydrocarbons". The job figures, particularly those in the production phase, depend a great deal on how much oil the company can viably extract, so I would treat them as very rough projections. "This will involve conventional drilling for oil and will not � either now or in the future � involve the process of hydraulic �fracking� for shale gas. This part of Lincolnshire does not have the specific rock-formation types that contain shale gas." At the time I wondered how they were so sure, but it turns out that a lot of information about our area's geology is available. There's an interactive map on the British Geological Survey's website, and that shows the type of bedrock, as well as records of boreholes that other companies have dug. So fracking is out of the question for this site, but other environmental questions remain. I asked Mark Abbott about the danger of global warming from exploiting a fossil fuel. "That is a political issue," he said. "This fuel attracts a significant amount of tax, 62%. That could be used to fund low-carbon energy solutions. Indigenous oil contributes to the local economy." He was also keen to stress that Egdon's activities are legal. I believe everything is political, so for me calling it a political issue is a non-answer. It's the politicians at LCC who will decide this matter, and some of them are well known for their antipathy to low-carbon energy. For example, LCC adopted an official policy against the unrestrained spread of wind farms in 2012. "Several of the other local environmental objections still apply, but the serious issue is global warming. If the COP21 at Paris in December 2015 reaches an international agreement on radical carbon reduction commitments then much of the already discovered fossil carbon will have to be left underground and unburnt and Egdon's resources will be left as stranded assets. If COP21 fails, we are all toast." As energy companies eye up the Gainsborough Trough, and the Prime Minister announces support and financial incentives for fracking, locals express their unease and uncertainty about shale gas extraction.